Fix My Ugly Fence - Let Us Clean It! Fence cleaning is comprised of either pressure washing or applying a chemical cleaing solution. Fence owners should consider getting their fence chemically cleaned if it looks like the onset of mold; pic attached. However, if the fence looks like the fence restoration – before ; then chemically cleaning the structure is less expensive process that would prep the surface for a solid acrylic stain which offers low wood-grain visibility and substantially can or should masks the age of a old fence. If a client desires to see high wood-grain visibility then pressure washing would be the way to go before applying a semitransparent oil based stain for high wood-grain visibility. Every project is treated as unique to individual owner addressing any specific needs as how to best restore and preserve that structure. Q. 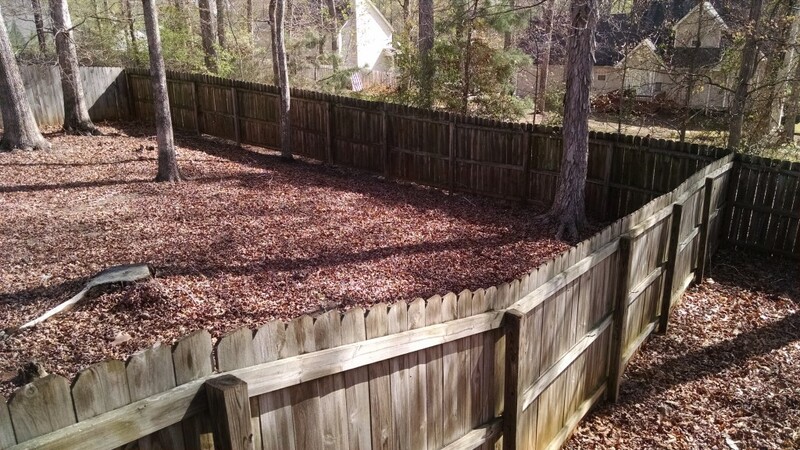 Does my new fence need to be cleaned before it can be treated? A. A newly fence does not need to be pressure washed prior to treatment. However, if dark spots are visible on a new fence – then it is highly advisable that you allow us to apply a chemical cleaning solution help to remove the on-set of minimal existing mold. Of course, any debris along the bottom such a leaves and mud splashing should be brushed off. If your structure runs under low lying branches or through a tree line inspect your fence regularly for mildew (greenish algae) color, which too can be removed with a chemical treatment.